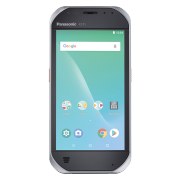 The Panasonic Toughbook FZ-T1 is extremely functional and is equipped with the Android 8.1 operating system. Its integrated 1D/2D barcode scanner may be operated via user-configurable scan buttons for left and right-handed users. Moreover, the Toughbook is very robust: it is IP68-certified and MIL-STD-810G tested. The 5’’ HD display of the mobile computer has a glove and rain mode - so it is ready for use in all weather conditions. Panasonic has equipped the Toughbook FZ-T1 with a powerful 3200 mAh battery, which is very easy to swap during operation. Enjoy uninterrupted data access for up to 12 hours. In the charging station, the battery is fully charged in about 2.5 hours. The Panasonic FZ-T1 comes factory-equipped with Bluetooth, WLAN, NFC, LTE, HSPA+, UMTS, EDGE, GPRS and GSM (data and voice). Order the Panasonic Toughbook FZ-T1 now with your sales representative. Make the call today!